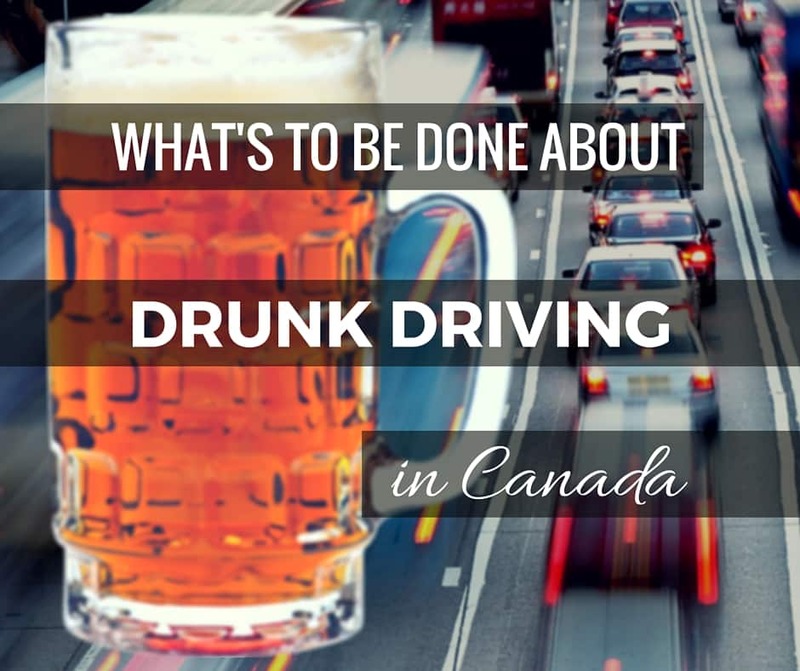 News What is to be done about Drunk Driving in Canada? Are the Penalties for Drunk Driving in Canada Enough? Recent events in the news have reminded us of the grave consequences of drunk driving and reignited the debate over how to deal with this systemic problem in our society. Last week, eighteen criminal charges, including four counts of Impaired Driving Causing Death, were laid against Marco Muzzo, a young man who comes from a wealthy and influential York Region family, after he was involved in a tragic accident in which three young children and their grandpa were killed while out for a Sunday afternoon drive. Earlier this week, Sabastian Prosa was sentenced to five years in prison after he was convicted of driving drunk the wrong way down Highway 427 in Mississauga, Ontario killing a father and daughter in a 2012 crash. Drunk driving is an epidemic in Canada. There is little debate about this. MADD estimates that in 2010 approximately one-half of motor vehicle fatalities in Canada, and over 63,800 motor vehicle injuries (approximately 175 per day), were related to impaired driving. Despite universal opinion that drinking and driving must be stopped, there appears to be a divergence of opinion over exactly what ought to be done to stop it. Much of the public discussion about preventing drinking and driving focuses on increasing the penalties in order to stem the tide. Understandably, many find it offensive that someone could kill or injure innocent people after making the reckless decision, albeit clouded, to drive drunk and “get away” with what is perceived as minimal jail time. Merely increasing the penalties associated with impaired driving convictions, whether or not innocent victims are injured or killed, will not solve the problem or result in justice for a number of reasons. Firstly, history has shown that merely increasing the penalty associated with a particular crime has only a limited effect on prevention. Otherwise, if one could demonstrate an inverse correlation between the severity of the penalty and the number of crimes committed, then a reasonable argument could be made that we ought to increase the penalty sufficiently to reduce the number of drunk driving incidents to as close to zero as possible. But that simply is not the case. This misguided assumption (that an increased penalty will reduce the number of drunk drivers on the road) is further compounded by the fact that the drunk person is not in a position to make a rational decision regarding the risks involved, either of getting caught or causing harm to another person, or the severity of the consequences when getting behind the wheel. Secondly, unlike violent crimes, like murder or robbery, no one who drives drunk intends to kill or injure anyone. In our society, we have determined that a person must have formed the intention (i.e., the mens rea or “guilty mind”) to commit an act, and in some cases to effect a specific outcome (e.g., murder), in order to be found guilty of committing the crime. Increasing the penalties associated with impaired driving causing injury or death to the point where they are at or close to the penalties associated with violent crimes reduces the seriousness we place on those types of violent offences and flies in the face of one of the cardinal principles of justice that the punishment must fit the crime. Thirdly, no penalty, no matter how severe, will bring a dead victim back to life or cure an injured victim from life-long injuries. What is so troublesome about drunk driving is that the consequences are so drastic and yet seemingly so easily preventable. For this reason, fatalities or injuries caused by a drunk driver rightfully elicit some of the deepest feelings of pain, sorrow and anger in all of us. We cry out for justice, and what we, as a society, really want, is to ease our pain and to satisfy our anger. But over-punishing any person will never quench our thirst for justice, and may even awaken in us the savage tendency for vengeance. To be sure, impaired driving needs to be punished. By driving drunk, a person has willingly and recklessly endangered the lives of others for the sake of their own convenience. But elevating the crime or the associated punishment to the level of our most serious and heinous crimes won’t undo what has already been done or satisfy our desire for justice. Rather, to put an end to impaired driving incidents, we need to examine how and why they happen and address the root causes. Accidents resulting from drunk driving are generally the result of a reckless decision made by an inebriated person to place the wellbeing of those around them at risk for the sake of their own convenience, whether it be to save money on cab fare or to ensure the driver doesn’t have to fetch his vehicle in the morning or otherwise. Drivers make these imprudent and irresponsible decisions because they can. If the option to drive drunk were eliminated, or at least significantly hindered, the vast majority of drivers would accept this fact and find a way to live with it. For example, on January 1, 1976, after the number of vehicular deaths had climbed to an unbearable high, legislatures across Canada made a policy decision to mandate the use of seat belts in every vehicle in order to reduce the number of deaths caused to passengers in motor vehicles. When it was determined that many people simply refused to buckle up, auto manufacturers began installing seat belt reminder systems in vehicles to remind drivers and front seat passengers to buckle up. In some countries, these reminder systems are required by law. Today, over 90% of Ontarians buckle up, compared to approximately 17.2% prior to 1976. Given significant advances in technology, it is now possible to install a breath alcohol ignition interlock device in every vehicle that would require the driver to blow into the device prior to starting the vehicle. If the person registers too much alcohol in their blood, the vehicle won’t start. If legislatures across Canada were to enact legislation requiring every vehicle sold in the province to contain such a device, it is almost certain that the number of drinking and driving incidents will be dramatically reduced. But, you might ask, couldn’t the driver simply enlist the assistance of a sober person to blow into the device in order to start the vehicle? Well, thankfully, further advances in technology now enable the device to monitor the alcohol content on an ongoing basis while the vehicle is in motion. At random times after the engine has been started, the device will require another breath sample. If the breath sample isn’t provided, or the sample exceeds the permitted blood alcohol level, the device will log the event, warn the driver, and then start up an alarm (e.g., lights flashing, horn honking) until the ignition is turned off, or a clean breath sample has been provided. As is often the case when new safety measures are mandated, many will decry the burden of additional regulation and criticize the inconvenience. This was certainly the case when seatbelts were implemented nearly 40 years ago. However, drastic times call for drastic measures. If we are serious about eliminating drunk driving in Canada, then we need to make it impossible, or at least extremely difficult, for someone to commit the crime. Allowing a drunk person to regulate his own behaviour and to make critical decisions involving life and death based on his own clouded assessment of risk has proven ineffective to date, and to continue down this path would be irresponsible – perhaps as irresponsible as driving drunk.